White Stripes Nation Manifesto II: "Jimmy the Exploder"
LegendaryMonkey: Friends, music fans, countrymen, lend me your ears; I come to give you the White Stripes, not to praise them. Okay, I'm a dirty, dirty liar. Of course we're going to praise them -- after all, Alberto here and I are trying to convince you, the electorate, to cast off the chains of repression that push you toward subpar music. 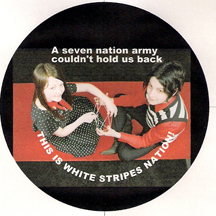 Rejoice in the brilliance of the White Stripes! 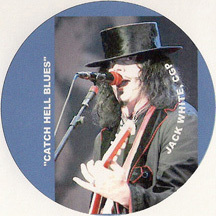 Generalissimo Alberto: Jack White began laying out the blueprint for the dictatorship of the proletariat in the first song on the first White Stripes album. Now Jimmy Well, do you want an explosion now? Do you want to explode now? You can see clearly how our visionary leader foretold our current revolutionary movement. Jimmy of course represents our Revolutionary Council blowing up objects of our oppression like Jack and Meg are going to blow up the charts. Wal-Mart only artist Garth Brooks- kaboom! LM: Only if Garth Brooks is wearing blue, which seems likely. After all, as Jack told 5 year-old Lucas (I expect he's older now), Jimmy really hates the color blue, and he rocks his red overalls. I'm sorry, go on. GA: Then, of course, there's the proletarian monkey, angered by the failed Bush dynasty, seeing red. This eerily foretells our Legendary Monkey flinging poo at the WS hatas, the betrayers of the revolution. LM: Damn yeah. I mean... I would never do that. Logic and reason, Albert. Logic and reason. GA: Stop interrupting me, monkeygirl. Yet Jack presents punk rock by way of an aggressively willful child like approach out of the Jonathan Richman playbook. He might as well have written a song about Curious George. This is certainly NOT any expression of grungeboy angst. LM: This is an amazing track with which to kick off a recording career. With this first song, you can trace Jack and Meg's musical past; you know they've grown up listening to Led Zeppelin and their contemporaries, you can feel the Detroit soul and blues influence, and the result resonates with a simplicity reminiscent of punk. This song is pure rock... in fact, I'd say it's representative of everything that is good about rock, all the things musicians seem to have forgotten in recent years. It's about emotion and power, even when singing about simple, childlike things. To me, this song is about what it's like to be a kid, lying on your bed surrounded by stuffed animals and listening to your parents records. It's about learning how amazing music can be. Jack and Meg are only a few years older than I am, so who knows? That could be the case. But though I've mentioned that this song reminds me, in particular, of Led Zeppelin, I still see it as wholly original. All music is derivative in some sense these days, it seems, and no one lacks musical influences that surface occasionally. The real achievement here is that while you can track the roots of the songs on The White Stripes, the album doesn't sound like anything else. And in twenty or thirty years, people are going to be writing about how the latest hot new thing sounds just like Jack and Meg. Before the Generalissimo starts threatening violence, I'd best get back to stumping for the revolution, however. To that end, I'd just like to say that while preparing for this review, and researching, I think I just listened to "Jimmy" upwards of fifty times. It's a pretty short song, weighing in at just under two and a half minutes, and I've been here for a while. And yet, I don't feel like turning off repeat just yet. If that's not a ripping endorsement, I'm not sure what else I can do for you guys. Unless, of course, you'd like me to start jumping on the bed and employing my powers of head-explody. If Jimmy can do it, why not this monkey? GA: Alrighty then, all you monkeys in White Stripes nation: Watch the apples of oppression exploding as you jump on the bed. Woo hoo hoo hoo hoo! Revolution is fun!